This one goes out to all my election nerd homies! Though we all know what and who won and lost in San Francisco's November 3 election, it wasn't until Thursday evening that SF's Department of Elections certified the final results. Want to take a look at the final numbers? Of course you do! According to DoE Director John Arntz, his people "applied a SHA-512 cryptographic function to all results reports associated with this election" before "concluding the official canvass of election results" Thursday night. So this is it, kids. Out of the 446,828 voters registered in SF, 203,069 came out for this election, making for a turnout of 45.45%. Which was better than expected, as only 20-30% was predicted. It's still worse than in presidential election years, though — in 2012, turnout was 72.56%. 2014's abortive soda tax still managed to beat Ed Lee in popularity (55.59% to his 55.3%), but them's the breaks. I'll leave it to SFist commenter Michael Petrelis to tell us if his third-person Disqus campaign was worth the 36 votes. John Robinson, whose display ads are still running on Geary, did a lot better in the Sheriff's race than I expected! 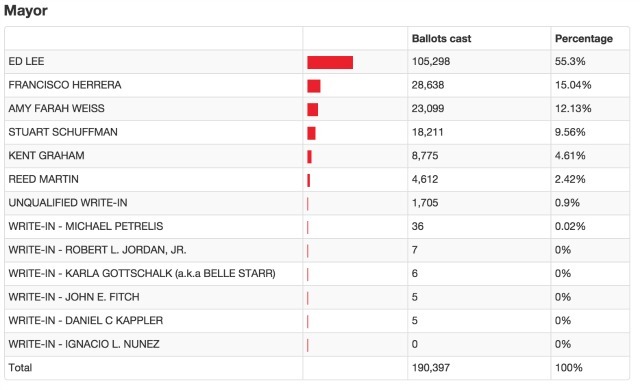 16,665 is a surprisingly good turnout for the D3 Supe vote, given that only 10,000 or so votes were expected in the extraordinarily expensive race. And then we have the props! The most interesting thing here is that I guess some people just choose not to vote on some, but marked others? I'm fascinated by this behavior! When I'm in the booth, I sort of feel like "well, hell, I'm already here..." and vote on everything. (Edited to clarify that that I vote even on issues about which I am not particularly passionate, not that I "did not take the time to educate" myself before voting! Geez, man.) But I guess there are several thousand folks who abstained one one or more. Unsurprisingly, Prop F (that's the Airbnb one) garnered the most votes either way, with 200,293 ballots cast (out of the 203,069 total). H, which got the lowest traffic, was intended to ensure that the energy used in CleanPowerSF is "green." It managed to scare up 184,708 ballots, 148,213 in its favor. You can see all the final numbers here. Have fun!